Frank Buckles was lucky enough to avoid most of the fighting during the first World War, but as an ambulance driver on the Western Front, he always said he saw plenty of the results of fighting. Later in life, Buckles would be on a commercial ship working as a purser and be captured by the Japanese during the invasion of the Philippines and be held for 38 months as a civilian prisoner during World War II, so Buckles was unique as a dual veteran of both World Wars, one as a soldier and the other a civilian. 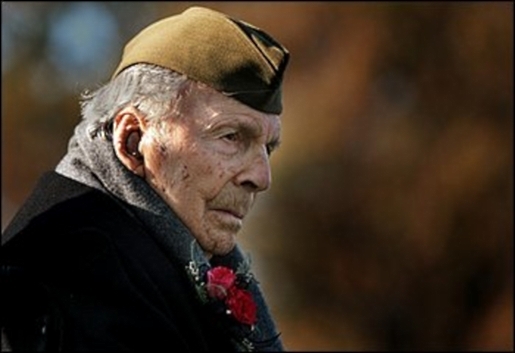 Frank Buckles, America’s last WWI veteran, died on Sunday at age 110. With the passing of Buckles, only two living WWI veterans remain, a 109-year-old Australian man and a 110-year-old British woman. Buckles, for his tireless activism concerning WWI veterans like himself and a national WWI monument, will be buried in Arlington National Cemetery, having made himself a war hero 95 years after the end of his soldiering career and a few years after WWI’s official end. Copyright © 2007-2010 PopularFidelity.com | Drop Popular Fidelity a line! | Meet the staff!